To characterize the molecular mechanisms of N-acetylaspartate (NAA) metabolism following traumatic brain injury (TBI), we measured the NAA, adenosine triphosphate (ATP) and adenosine diphosphate (ADP) concentrations and calculated the ATP/ADP ratio at different times from impact, concomitantly evaluating the gene and protein expressions controlling NAA homeostasis (the NAA synthesizing and degrading enzymes N-acetyltransferase 8-like and aspartoacylase, respectively) in rats receiving either mild or severe TBI. 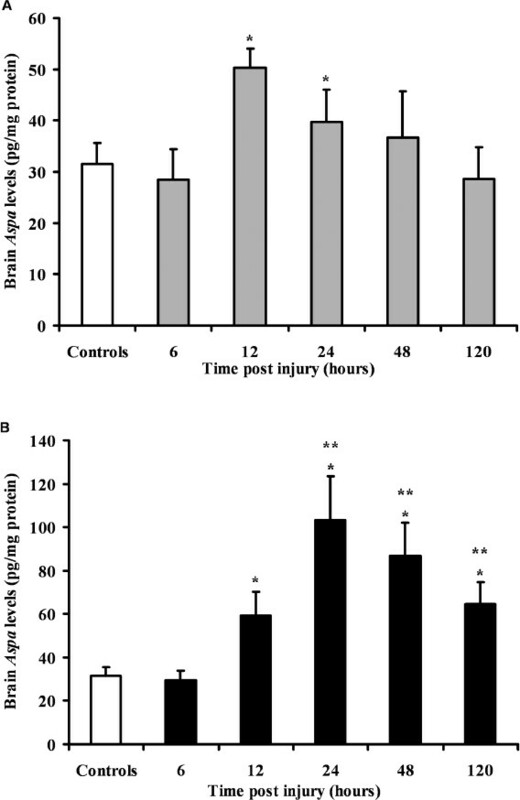 The reversible changes in NAA induced by mild TBI were due to a combination of transient mitochondrial malfunctioning with energy crisis (decrease in ATP and in the ATP/ADP ratio) and modulation in the gene and protein levels of N-acetyltransferase 8-like and increase of aspartoacylase levels. The irreversible decrease in NAA following severe TBI, was instead characterized by profound mitochondrial malfunctioning (constant 65% decrease of the ATP/ADP indicating permanent impairment of the mitochondrial phosphorylating capacity), dramatic repression of the N-acetyltransferase 8-like gene and concomitant remarkable increase in the aspartoacylase gene and protein levels. The mechanisms underlying changes in NAA homeostasis following graded TBI might be of note for possible new therapeutic approaches and will help in understanding the effects of repeat concussions occurring during particular periods of the complex NAA recovery process, coincident with the so called window of brain vulnerability. N-acetylaspartate (NAA) is a brain-specific metabolite and one of the most abundant low molecular weight compounds of the human brain having concentrations (up to 15 mmol/L) similar to those of the neurotransmitter glutamate (1). NAA is synthesized in neurons from acetyl-CoA and aspartate by aspartate N-acetyltransferase, a membrane-bound enzyme recently identified as N-acetyltransferase 8-like (Nat8l) (2) which has been associated with endoplasmic reticulum (3) rather than mitochondria (4). Notwithstanding, the mitochondrial localization of NAA biosynthesis appears strongly corroborated by the data showing that decrease in NAA production is affected by malfunctioning of the mitochondrial aspartate transporter Slc25a12 (solute carrier family 25 (aspartate/glutamate carrier), member 12), the activity of which is evidently necessary to guarantee a constant aspartate supply to mitochondria for NAA biosynthesis (5). To ensure NAA turnover, the molecule must move cellular compartments to reach oligodendrocytes (astrocytes participate to a lower extent in NAA degradation), where it is degraded into acetate and aspartate by aspartoacylase (Aspa) (6). Therefore, NAA has a complex homeostasis regulated by the rate of biosynthesis by Nat8l, outflow from neurons, uptake by oligodendrocytes and degradation by Aspa. In addition, due to the high indirect energy expenditure necessary to synthesize NAA, its biosynthesis is in strict correlation to mitochondrial function and cell energy state (7). In spite of the hundreds of studies related to NAA, its exact biological role is far from being clearly identified. Source of acetate for lipid myelin biosynthesis (8), reservoir of glutamate (9) and regulator of water homeostasis (1) are some of the main possible cellular functions in which NAA appears to play a significant role. Pathologically, it is known that the failure in NAA degradation, due to defective Aspa, causes the leukodystrophy with fatal prognosis known as Canavan disease, characterized by spongy neurodegeneration, profound mental retardation, with modest NAA accumulation in the brain and massive excretion in urine (10). Similarly, in a single patient known at present, it has recently been demonstrated that the inherited defect of Nat8l, causing a dramatic decrease in cerebral NAA, is compatible with life but is associated with truncal ataxia, marked developmental delay, seizures and secondary microcephaly (2). Several studies have clearly demonstrated that NAA is affected negatively by various acute and chronic states of neurodegeneration, including brain ischemia (11), stroke (12) multiple sclerosis (13), Alzheimer’s disease (14) and others, all having in common the malfunction of mitochondria. A vast number of studies have indicated that the alteration of mitochondrial functions is one of the crucial events capable of compromising neuronal survival following traumatic brain injury (TBI) (15) and leading to cell energy imbalance (16). In our previous experiments, evidence showed that mild TBI (mTBI) and severe TBI (sTBI) in the rat produced a significant NAA depletion, spontaneously reversible in mTBI only (16,17). This phenomenon clearly mirrored the time-course variations of cerebral ATP and mitochondrial phosporylating capacity (measured by the ATP/ADP ratio), both influenced either by the severity of TBI or by the time after impact (16,17). These findings confirmed the close correlation between NAA and ATP/mitochondrial function and suggested that NAA is a valid surrogate marker for an indirect evaluation of the cerebral energy state. Furthermore, in groups of athletes measured by proton magnetic resonance spectroscopy (1H-MRS), we have shown that NAA underwent a transient decrease following concussion with a normalization time lasting much longer than that needed for the postconcussive symptom disappearance (18). In addition, we also observed that athletes reporting a second concussion during the recovery process of brain metabolism had a further NAA depletion accompanied by much longer times for NAA replenishment (19). With the aim of better characterizing the molecular mechanisms underlying perturbation of NAA metabolism following graded TBI, we measured NAA, ATP and ADP (to calculate the ATP/ADP ratio as an index of the mitochondrial phosphorylating capacity) and the gene and protein expressions of the enzymes responsible for NAA homeostasis (NAT8L and ASPA) in brain tissue extracts from rats receiving either mTBI or sTBI at different times from impact. A total of 99 animals was used in this study. Sample size was determined assuming a significantly pathological 20% change of the parameters under evaluation, with respect to those determined in controls. With an a value of 5% and with six values at each time point, a 95% power was achieved. The experimental protocol was approved by the Ethical Committee of the Catholic University of Rome, according to international standards and guidelines for animal care. Male Wistar rats of 250–300 g were used in this study. They were randomly divided into three groups: (i) sham-operated as control; (ii) mild diffuse TBI (mTBI group); and (iii) severe diffuse TBI (sTBI group). Animals were anesthetized with intraperitoneal (IP) injection of propofol 23 mg/kg body weight. Mild or severe TBI was induced by dropping a 450-g weight from 1- or 2-m height, respectively, according to the weight drop impact acceleration model (20). These two levels of injury have been characterized previously histologically and morphologically (20), as well as biochemically and metabolically (7,16,17), and classified as mTBI and sTBI. Rats that suffered from skull fracture, seizures, nasal bleeding or did not survive the impacts were excluded from the study. After 6, 12, 24, 48 and 120 h from brain injury, rats (n = 9 for each time point in each of the two groups of injured animals) were again anesthetized and then immediately euthanized. Sham-operated animals acted as the control group and were euthanized 12 h after the initial anesthesia (n = 9). To minimize metabolite loss, an in vivo craniectomy was performed on all animals during anesthesia. The rat skull was carefully removed, the brain exposed and sharply cut along the sagittal fissure and the two hemispheres were separately freeze clamped by aluminum tongs precooled in liquid nitrogen and then immersed in liquid nitrogen. The freeze-clamping procedure was introduced to accelerate freezing of the tissue, thus minimizing potential metabolite loss (21). Total RNA was extracted by homogenizing one hemisphere in TRIzol (Invitrogen/Life Technologies, Carlsbad, CA, USA), using the ULTRA-TURRAX homogenizer (Janke & Kunkel, IKA, Staufen, Germany) at 24,000 rpm/min, to produce a final 10% homogenate (weight:volume) according to the manufacturers’ instructions. Crude homogenates suitable for Nat8l and Aspa quantification were obtained by homogenizing one hemisphere in 15 mmol/L KCl + 1 mmol/L KH2PO4, pH 7.4, at 24,000 rpm/min for 90 s in the cold, followed by centrifugation at 18,690g for 15 min at 4°C. The tissue preparation for metabolite analysis was achieved by deproteinizing one hemisphere according to the organic solvent deproteinizing procedure described in details elsewhere (22). To obtain simultaneous measurements at each time point of the parameters of interest and to have their measurements in 6 animals at each time point for both levels of injury, the following scheme of tissue preparation was performed: 9 animals at each time point for each level of injury, 18 hemispheres at each time point, 3 right plus 3 left hemispheres were processed for RNA and protein extractions, 3 right plus 3 left hemispheres were processed for RNA and metabolite extractions and 3 right plus 3 left hemispheres were processed for metabolite and protein extractions. By use of this protocol for tissue manipulation and properly mixing the different processing of the right and left hemispheres, it was possible to have a concomitant evaluation of NAA, gene expression and protein quantification of Nat8l and Aspa, each performed in six hemispheres of six different animals. RNA extracted from brain samples was reverse transcribed to cDNA by Superscript II Reverse Transcriptase Kit (Invitrogen/Life Technologies). From each sample, 1 µg of total RNA, 50 ng of oligo dT primers (Roche Molecular Biochemicals [Roche Diagnostics Ltd., Burgess Hill, UK]) and 20 U of Superscript II Reverse Transcriptase, in a total volume of 20 µL First Strand Buffer, were incubated at 42°C for 60 min. The concentration and purity of the resulting cDNA was then determined with a ND-1000 UV-Vis Spectrophotometer (NanoDrop, Wilmington, DE, USA [Thermo Fisher Scientific Inc., Waltham, MA, USA]). Real-time quantitative PCR (RT-qPCR) with melting curve analysis was performed in Bio-Rad iQ5 Realtime PCR Detection System (Bio-Rad, Hercules, CA, USA). In each reaction, 100 ng of cDNA were mixed with 25 µL 2× SYBR Green PCR Master Mix (Applied Biosystems/Life Technologies), proper primers (300 nmol/L final concentration) in a final volume of 50 µL. The thermal profile began with incubation at 95°C for 10 min, followed by 40 amplification cycles alternating 94°C for 15 s and 60°C for 60 s. To confirm the specificity of reactions, a melting curve was produced by conducting 81 melting cycles of 30 s every 0.5°C, from 55°C to 95°C. Data were analyzed by the iQ5 Optical System Software (Bio-Rad). Primers were designed with the 0.2 version of the Primer3 Input software developed by the Whitehead Institute for Biomedical Research (Cambridge, MA, USA) and using as template the sequences of Rattus norvegicus NAT8L (NM_001191681.1) and ASPA (NM_024399) published by the National Center for Biotechnology Information (Bethesda, MD, USA). The following primer sequences were used: NAT8L forward 5′-CCCATGAGGAGGACA ACACA-3′, NAT8L reverse 5′-TGTGT CTGAAGCCCAGTGAC-3′; ASPA forward 5′-TCCAAGGAACGAAAGTGGAG-3′, ASPA reverse 5′-GAGTCTCCACCCAGT GGAAT-3′. For accurate gene expression measurements with RT-qPCR, results were normalized to the housekeeping gene of ubiquitin C of Rattus norvegicus (Ubc NM_017314.1), selected using the geNorm Housekeeping Gene Selection Kit (Primerdesign Ltd, Rownhams, Southampton, UK) from twelve candidate reference genes. Changes in transcript abundance of tested genes (NAT8L, ASPA) were calculated using the 2−ΔΔCT method as described by Livak and Schmittgen (23). Quantification of Aspa and Nat8l proteins was carried out using immuno assays enzyme-linked immunosorbent assay (ELISA) kits (Cusabio Biotech, Wuhan, China) according to the manufacturer’s instructions. Briefly, 100 µL of standards and supernatants of brain homogenates were incubated in microplate wells precoated with antibody specific for Aspa or Nat8l. After incubation, biotinylation and conjugation with streptavidinhorseradish peroxidase plates were incubated for 30 min at 37°C with 3,3′,5,5′-tetramethylbenzidine. The reaction was stopped by the addition of 50 µL of acidic solution and absorbance of the resulting yellow product was measured spectrophotometrically at 450 nm (Molecular Devices, Sunnyvale, CA, USA). Using this protocol, the standard curves were linear and ranged from 28 pg/mL to 1,800 pg/mL for Aspa and from 31.25 pg/mL to 2,000 pg/mL for Nat8l. NAA, ATP and ADP were measured in 20 µL of deproteinized brain extracts by high performance liquid chromatography (HPLC) according to ion-pairing methods formerly set up in our laboratory (22) and using a Hypersil C-18, 250 × 4.6 mm, 5-µm particle size column, provided with its own guard column (Thermo Fisher Scientific Inc.). The HPLC apparatus consisted of a SpectraSystem P2000 pump system (Thermo Fisher Scientific Inc.) and a highly-sensitive UV6000LP diode array detector (Thermo Fisher Scientific Inc.) set up between 200- and 300-nm wavelength. Assignment and calculation of NAA and adenine nucleotides (ATP and ADP) were carried out at 206 and 260 nm wavelength, respectively, by comparing retention times, absorption spectra and area of the peaks with those of true NAA, ATP and ADP with known concentrations. The within group comparison at each time was performed by one-way analysis of variance (ANOVA). Differences across groups were estimated by two-way ANOVA for repeated measures. The Fisher protected least square was used as the post hoc test. Differences were regarded as statistically significant at a value of p < 0.05. 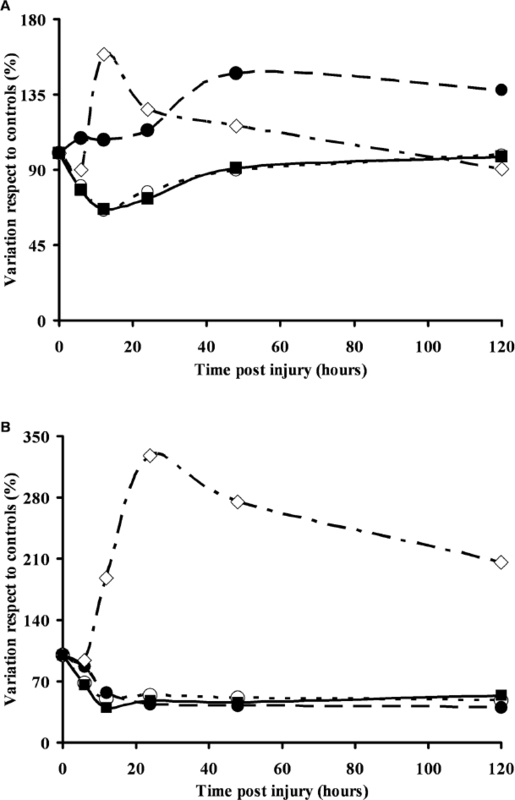 To grossly account for the different severity of injury using this model of TBI, a mortality rate of 11.8% (6/51 rats) was recorded in the group of sTBI, while all mTBI rats survived to the impact for the desired time. In Figure 1, the time course changes of NAA (panel A), ATP (panel B) and ATP/ADP ratio (panel C) in rats following mTBI or sTBI are reported. In mTBI, minimal values of these parameters were recorded at 12-h postinjury, with NAA fully recovering at 120-h postimpact and ATP and the ATP/ADP ratio showing no differences from controls already at 48-h postinjury. In sTBI, sudden NAA, ATP and ATP/ADP ratio falls were observed at 6-h postimpact, with stable 50% to 65% decreases recorded hereinafter. 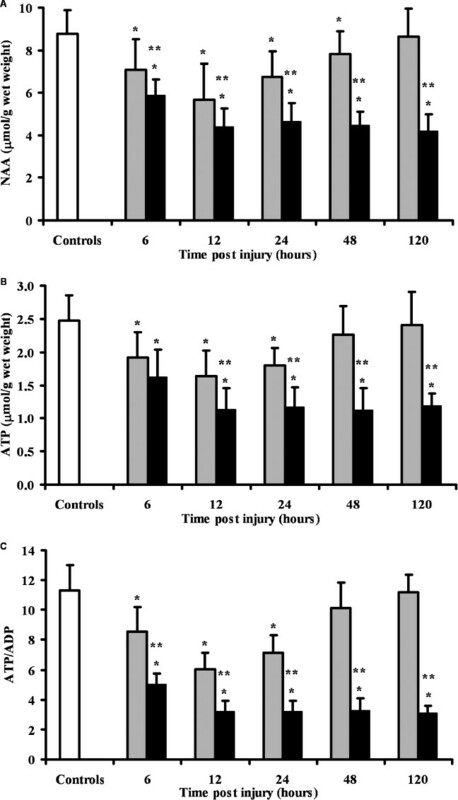 NAA and ATP concentrations, as well as the mitochondrial phosphorylating capacity (ATP/ADP ratio), were strictly dependent on injury severity, with mTBI rats accounting for higher values of these parameters at 12-, 24-, 48- and 120-h postinjury than those determined in sTBI rats at corresponding times (p < 0.01). NAA and energy metabolism after graded TBI. Time course changes of cerebral concentrations of NAA (A) and ATP (B) and of the value of the ATP/ADP ratio (C), in rats experiencing diffuse TBI of graded severity ( Open image in new window mTBI; ■, sTBI). Values of the parameters at each time point are the mean of 6 animals (3 left plus 3 right hemispheres) and are expressed as µmol/g wet weight. Standard deviations are represented by vertical bars. *Significantly different from controls (p < 0.05). **Significantly different from the corresponding time in mTBI rats (p < 0.05). As illustrated in Figure 2, TBI affected the transcript levels of NAT8L depending on injury severity. In fact, mTBI (panel A) caused an initial significant NAT8L down-regulation at 6-h postinjury, followed by a return to preimpact values and then a significant overexpression at 24-, 48- and 120-h postinjury (p < 0.05). By contrast, a dramatic downregulation of the transcript for NAT8L was determined following sTBI (panel B), at early phases after injury (6 h after TBI) and was not followed by any type of recovery (mean residual postinjury levels = 25% of the value of controls; p < 0.001). Transcript levels for NAT8L in sTBI rats were significantly lower at any time after injury than values recorded in mTBI animals (p < 0.001). Changes of the NAT8L gene expression following graded TBI. Time course changes of NAT8L cerebral gene expression in rats experiencing diffuse mTBI Open image in new window or diffuse sTBI (■), Values at each time point are the mean of 6 animals (3 left plus 3 right hemispheres) and are expressed as the NAT8L/UBC ratio, where UBC is the housekeeping gene ubiquitin C. Standard deviations are represented by vertical bars. *Significantly different from controls (p < 0.05). **Significantly different from the corresponding time in mTBI rats (p < 0.05). As shown in Figure 3, mTBI (panel A) caused ASPA expression to increase 2.2 times over the basal value (P < 0.001), at 6-h postinjury. This was, however, pursued by a return to preimpact values by 12-h post-mTBI, with no further changes at the subsequent times. Inducing sTBI to rats provoked a dramatic 7.2 times overexpression of the ASPA gene (panel B) already at 6-h postimpact (p < 0.001 compared with controls). At 12-, 24-, 48- and 120-h postinjury, sTBI animals had an ASPA overexpression of 4.5, 2.3, 2.2 and 1.7 times than the value of controls (p < 0.001). In comparison with mTBI animals, rats subjected to sTBI had higher levels of mRNA for ASPA at any time point after injury (p < 0.01). Changes of the ASPA gene expression following graded TBI. Time course changes of ASPA cerebral gene expression in rats experiencing diffuse mTBI Open image in new window or diffuse sTBI (■). Values at each time point are the mean of 6 animals (3 left plus 3 right hemispheres) and are expressed as the ASPA/UBC ratio, where UBC is the housekeeping gene ubiquitin C. Standard deviations are represented by vertical bars. *Significantly different from controls (p < 0.05). **Significantly different from the corresponding time in mTBI rats (p < 0.05). 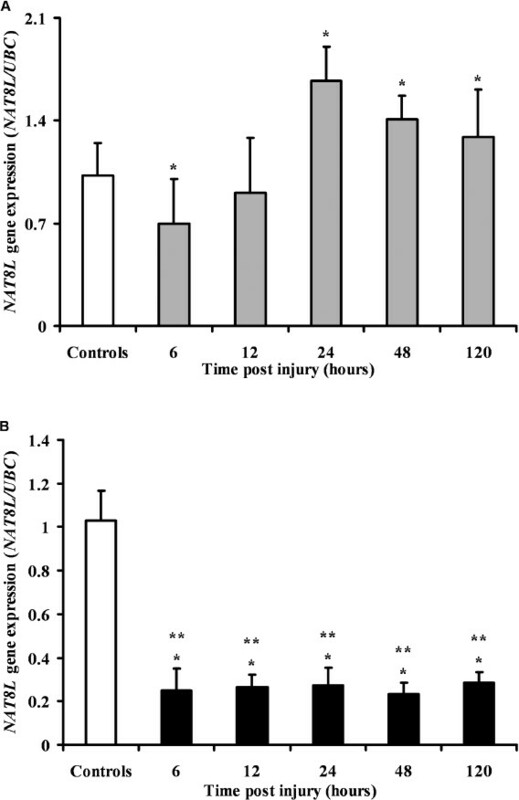 In Figure 4, the time course changes in the Nat8l protein level recorded in mTBI rats (panel A) are reported. No differences with respect to controls were seen at 6, 12 and 24 h following mTBI, but significantly higher Nat8l levels were recorded either at 48- or at 120-h postinjury (p < 0.01), indicating that the increase in transcript for Nat8l was accompanied by an increase in the protein synthesis. In panel B, it is possible to observe that sTBI rats underwent to a significant decrease in Nat8l protein levels at 12-, 24-, 48- and 120-h postinjury (p < 0.001), demonstrating that the dramatic downregulation of the gene in the severely injured brain (Figure 2, panel B) hinders restoration of the amount of the NAA synthesizing enzyme at preimpact levels. In addition, at 12-, 24-, 48- and 120-h postinjury, sTBI rats had significantly lower Nat8l protein levels than those recorded in mTBI rats at corresponding times (p < 0.001). Changes of the Nat8l protein level following graded TBI. Time course changes of cerebral protein levels of Nat8l in rats experiencing diffuse mTBI Open image in new window or diffuse sTBI (■). Values at each time point are the mean of 6 animals (3 left plus 3 right hemispheres). Standard deviations are represented by vertical bars. *Significantly different from controls (p < 0.05). **Significantly different from the corresponding time in mTBI rats (p < 0.05). Figure 5 clearly shows that Aspa protein levels following an mTBI (panel A) were modestly increased only after 12-and 24-h postinjury (p < 0.05 with respect to controls), with no significant differences compared with controls at the other time points. Conversely, a massive 1.9-, 3.3-, 2.7- and 2-times increase in Aspa protein levels following an sTBI (panel B) were recorded, respectively, at 12-, 24-, 48-and 120-h postinjury (p < 0.001 compared with controls). 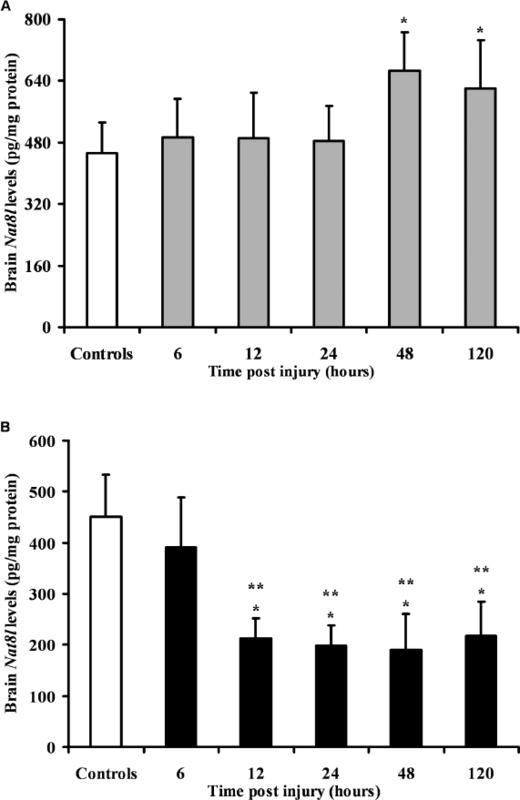 Aspa protein levels higher than those determined in mTBI at corresponding times were determined after 24-, 48- and 120-h postinjury (p < 0.001). Changes of the Aspa protein level following graded TBI. Time course changes of cerebral protein levels of Aspa in rats experiencing diffuse mTBI Open image in new window or diffuse sTBI (■). Values at each time point are the mean of 6 animals (3 left plus 3 right hemispheres). Standard deviations are represented by vertical bars. *Significantly different from controls (p < 0.05). **Significantly different from the corresponding time in mTBI rats (p < 0.05). To better depict how graded TBI differentially affected the NAA homeostasis, we reported in Figure 6 the time course changes occurring to NAA, gene expression of NAT8L and ASPA, protein levels of Nat8l and Aspa in rats following either mTBI (panel A) or sTBI (panel B). Changes of the mechanisms regulating NAA homeostasis after graded TBI. Overview of the time course changes of the parameters controlling NAA homeostasis in rats experiencing diffuse mTBI (A) or diffuse sTBI (B). Values of the different parameters at each time point are the mean of 6 animals (3 left plus 3 right hemispheres). Standard deviations and significances have been omitted for the sake of clarity. O, NAA; ■,ATP; ●, Nat8l protein levels; ◇, Aspa protein levels. It is worth noting that, in both types of TBI severity, changes in NAA and gene expressions of NAT8L and ASPA occurred at early stages (6 h) after injury, indicating that parameters controlling the NAA homeostasis are altered precociously by the traumatic event. It is evident from the comparison of the various trends reported in panels A (mTBI) and B (sTBI) that in mTBI rats the time interval 12- to 24-h postinjury is crucial to trigger the biochemical processes necessary to restore NAA concentrations to preimpact values, as well as to normalize mitochondrial-dependent energy metabolism (see the time course of ATP in mTBI rats, panel B of Figure 1). Irreversibility in the alterations of NAA homeostasis in sTBI is clearly demonstrated by the protracted decrease in gene expression of NAT8L and by the dramatic overexpression of the ASPA gene, both leading to an irreversible decrease in the protein Nat8l levels and a concomitant increase in the Aspa protein levels. These facts, accompanied by persistent mitochondrial dysfunction, as demonstrated by a 50% decrease in ATP concentration at 12-, 24-, 48- and 120-postinjury (Figure 1, panel B), caused a net irreversible NAA depletion by 50% recorded even at 120-h post-sTBI. In spite of its relative structural simplicity and of its age (it was discovered by Tallan in 1957 ), NAA is still an orphan molecule waiting to be assigned a strictly convincing precise biological function (1,8,10). Due to its unique properties of being brain specific and highly abundant in the nervous tissue (1), easily measurable ex vivo with proper techniques in any type of biological sample (17,22), measurable in vivo in human beings by 1H-MRS thanks to its strong spectroscopic signal (18,19,25), affected by several pathological states of acute and chronic brain sufferance (11, 12, 13, 14,25), a relevant number of studies on this compound are published yearly indicating a high scientific interest in NAA. Also in TBI, NAA is thought of increasing importance since it was observed that NAA concentration is negatively affected by TBI (26,27), with the degree of its depletion depending on TBI severity (16) and with the changes mirroring those occurring in energy metabolism, mitochondrial phosphorylating capacity and, in particular, ATP levels (16). Therefore, measuring NAA can now be considered as an indirect measurement of the brain energy state and it is of significant utility in determining the time for a safe return of athletes to play following concussion (18,19). With these premises, we undertook the present study with the aim of clarifying how the complex NAA homeostasis, influenced also by mitochondrial functions and energy state, is affected by graded TBI. To this purpose, we took into consideration NAA and ATP concentrations and values of the ATP/ADP ratio (as a measure of the mitochondrial phosphorylating capacity), as well as the gene expressions and the protein levels of Nat8l and Aspa, the enzymes directly regulating brain NAA homeostasis. A general overview of the time course changes occurring to NAA and to the factors affecting its homeostasis after either mTBI (panel A) or sTBI (panel B) is depicted in Figure 6. The profound differences between a mild and a severe TBI are self-evident: NAA and factors controlling its homeostasis spontaneously return to preimpact values in mTBI only. When observing the kinetics of the different parameters in mTBI rats, it is possible to elicit a timetable of the cascade of molecular events that contribute to modify NAA metabolism. It has previously been demonstrated that NAA, ATP and the ATP/ADP ratio undergo a significant decrement already after 0.5 h (28) or 1 h (29), that is, during the first time interval after injury (0–6 h) considered in the present study. Therefore, it is conceivable that the NAA decrease here measured at 6-h postinjury is only due to the mTBI induced mitochondrial malfunctioning negatively affecting energy metabolism (concomitant decrease in ATP and ATP/ADP ratio), limiting acetyl-CoA availability and the overall energy expenditure for NAA biosynthesis. During this period of time, NAA depletion should mainly reflect the neuronal energy crisis and its measurement has the meaning of an indirect ATP measurement. It is very important to observe that a decrease in the gene expression of NAT8L and an increase in the gene expression of ASPA also were observed at this time point (Figure 6, panel A). 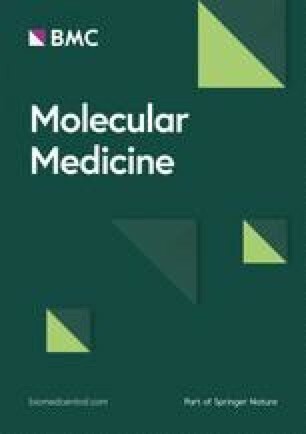 The NAT8L gene downregulation might be an early occurrence of the recently reported gene program of neuroprotection, found in an in vitro model of mild stretch injury (comparable in damage to mTBI) and aimed at optimizing ATP consumption in a period of mitochondrial malfunctioning (30). Concerning ASPA overexpression, it may be hypothesized that an increased rate of NAA efflux from neurons is operating after mTBI (31). This increase in NAA, that in time reaches the oligodendrocyte cellular compartment where degradation into aspartate and acetate occurs, might exceed the physiological Aspa degrading capacity and might represent the signal initiating the 2.3 times ASPA overexpression (see also Figure 3, panel A). During the 6- to 12-h period following mTBI a further decrease in NAA, ATP and ATP/ADP ratio takes place (Figure 1, panels A, B and C and panel A of Figure 6), with no differences in either gene expression or protein levels of Nat8l. This additional NAA decrement may be caused by the combination of at least two factors: a protracted impairment of the mitochondrial phosphorylating capacity (decreased ATP/ADP ratio) directly affecting the ATP synthesis and still causing neuronal energy deficit, and an increased rate of NAA degradation in the oligodendrocyte compartment caused by an accelerated efflux from neurons and by an augmentation in the Aspa protein levels, now capable of efficiently executing NAA hydrolysis. This 1.6-times increase in Aspa protein was delayed by 6 h compared with the ASPA gene overexpression which, in the 6- to 12-h period, remained overexpressed compared with the preimpact values. Hence, at 12-h post-mTBI, NAA depletion probably reflects not only the neuronal energy crisis but also the increased Aspa levels and its measurement still has the meaning of an indirect ATP measurement, thanks to the similarity in the changes of these two compounds (Figure 1, panel A). The 12- to 24-h period following mTBI is characterized by an inversion in the trends of the different parameters under evaluation and may be considered a crucial period not only for the process of recovery of NAA homeostasis, but also for that of the brain central metabolism. In fact, it is possible to observe a gradual but consistent NAA and ATP increase and a recovery of the ATP/ADP ratio; presumably, higher ATP levels might also be obtained for the effect of the gene program of neuroprotection aimed at optimizing ATP consumption (30). The NAT8L gene expression increased more than 1.6 times over the preimpact value and the ASPA gene expression approximated to the value determined in controls. A slight increase in the Nat8l protein levels and a decrease in that of Aspa (Figure 6, panel A) was observed during this time interval. At 24-h post-mTBI, the beginning of NAA recovery should reflect the benefits of the cell energy saving obtained by the gene program of neuroprotection and of the increase and decrease in Nat8l and Aspa levels, respectively; again, NAA measurement still has the meaning of an indirect ATP measurement. The 24- to 48-h post-mTBI period is characterized by a significant increase in the NAA, ATP and ATP/ADP ratio (Figure 1, panels A, B and C). It is evident (Figure 6, panel A) how the spontaneous nature of the recovery of the complex NAA homeostasis is realized during this period of time by a concomitance of multiple factors, all acting to the same direction. In fact, the NAT8L overexpression (occurred during the previous 12 to 24 h) led to a 1.4-times increase in the Nat8l protein levels. In the meantime, either the gene expression or the protein Aspa levels decreased consistently, thus contributing to the overall increase of NAA concentration. At 48-h post-mTBI, the advanced NAA recovery probably reflects the restoration of mitochondrial functions and the significant increase and decrease in Nat8l and Aspa protein levels; hence, determining postinjury NAA normalization has the meaning of an indirect measure of ATP normalization. The last post-mTBI period considered in this study (48 to 120 h) is characterized by normalization of NAA, ATP and the ATP/ADP ratio (Figure 1, panels A, B and C), NAT8L and ASPA gene expressions, Aspa protein levels, with the Nat8l protein level still higher than controls (Figure 6, panel A). The full spontaneous recovery of NAA homeostasis observed at 120-h post-mTBI then results from the combination of the restored capacity of mitochondria to supply cerebral energy demand and the proper changes in gene expressions and protein levels of the enzymes controlling NAA biosynthesis (Nat8l) and degradation (Aspa). At this time point, measuring normal NAA is equivalent to measuring normal ATP and recovered mitochondrial phosphorylating activity, therefore determining closure of the window of metabolic brain vulnerability (6,7,18,19,32). A much simpler timetable could be derived when considering the changes occurring after an sTBI (Figure 6, panel B). It is worth recalling that it has previously been demonstrated that the very early decreases in NAA, ATP and ATP/ADP ratio occurring after an sTBI are much more evident than those observed after an mTBI (28). Even in the present study, at 6 h we found significantly lower NAA, ATP and ATP/ADP ratio levels in sTBI than in mTBI (Figure 1, panels A, B and C), indicating a more pronounced mitochondrial dysfunction in the severely injured animals. To counteract this precocious dramatic energy crisis, neurons respond by repressing expression of the NAT8L gene to avoid acetyl-CoA consumption for NAA biosynthesis: this should allow the use of acetyl-CoA for other reactions of major importance for cell survival. Relevant loss in neuronal NAA after sTBI should cause a continuous high influx of this molecule into oligodendrocytes: by assuming that this is the signal for the ASPA gene overexpression, it is possible to explain the more than seven-times increase in the ASPA mRNA occurring at 6-h post-sTBI (Figure 6, panel B). The 6- to 12-h period following sTBI produced a further marked decrease in NAA, ATP and ATP/ADP ratio (Figure 1, panels A, B and C), a downregulation of the NAT8L gene, an overexpression by 4.5 times of the ASPA gene, a decrease in the Nat8l protein levels and the beginning of a relevant increase in the Aspa protein levels (Figure 6, panel B). Therefore, all conditions that determine an irreversible loss of NAA homeostasis are realized after an sTBI: persistent mitochondrial malfunctioning with a more than 65% decrease in their capacity to phosphorylate ADP into ATP with consequent dramatic energy crisis, repression of the NAT8L gene with concomitant decrease in Nat8l protein synthesis, plus upregulation of the ASPA gene with increase in Aspa protein synthesis. The 12- to 24-h post-sTBI are characterized by constant NAA, ATP and ATP/ADP ratio decreases (Figure 1, panels A, B and C) and by no change in gene expression and protein levels of Nat8l (Figure 6, panel B). By contrast, levels of Aspa protein increased up to 3.3 times compared with controls, thus promoting the biochemical conditions suitable to hinder NAA recovery. The 24 to 48 and the 48 to 120 h periods are featured by unchanged metabolic conditions, with concentrations of both NAA and ATP equal to the 50% of controls and with values of the ATP/ADP ratio lower than the 70% of those recorded in control rats, with minimal gene expression and protein levels of Nat8l and with steady upregulation of the ASPA gene and consequent increased Aspa protein levels (Figure 6, panel B). It may be possible that the dramatic NAA decrease in the case of an sTBI, occurring either in animals (16,28) or in human beings (27,33), has the meaning of a desperate attempt by the brain to use any possible fuel (acetate) with which to sustain its energy requirement, during a period of compromised capacity to use glucose as the main source for energy requirements (34). This might also explain the exaggerated upregulation of the ASPA gene leading to a very relevant increase in the Aspa protein levels. However, concerns about this interpretation can be raised when thinking that the transformation of acetate into acetyl-CoA by acetyl-CoA synthetase is an ATP-dependent reaction (35) and that it should occur in a severely injured brain during a period of profound energy crisis. Even though these results strongly reinforced the link between NAA homeostasis and ATP/mitochondrial-related energy state, they do not clarify the biological role of NAA. To this purpose, the hypothesis currently considered as the most valid indicates that the sole NAA function, through its degradation by Aspa within oligodendrocytes, is to ensure an adequate acetate supply for lipid myelin biosynthesis (8). This assumption has recently been questioned (2,3) even though same authors, asserting that the main role of NAA is to act as an acetate donor, produced additional evidences to support their theory (36). In our opinion, there are some concepts and some considerations that should be taken into account before considering this hypothesis valuable. First of all, the definition given to NAA as a storage molecule is certainly objectionable, whatever is its role. A storage molecule, by definition, should be somehow saved (glutamate, glycogen and so on) and used upon request thanks to intra- or extracellular signal(s). It is difficult to accept this concept for NAA which is continuously synthesized and degraded at the rate of 1.44 times per day (1,37) and, up to now, no specific signals for NAA translocation from neuronal mitochondria to neuronal cytoplasm and then from neuronal cytoplasm to oligodendrocyte cytoplasm (hypothetically, either via extracellular space or through a direct neuron → oligodendrocyte exchange) have been demonstrated. Neither have specific NAA transporters ever been isolated. The other consideration refers to the energetic inconvenience of using NAA-deriving acetate: i) the NAA synthesis requires the acetyl-CoA hydrolysis (ΔG = −31.5 kJ/mol) and the waiver to produce 3 NADH and 1 FADH2 (10–12 ATP); ii) the use of acetate to form acetyl-CoA is catalyzed by acetyl-CoA synthetase (35) which, in an energy-dependent reaction, hydrolyzes ATP into AMP + Pi-Pi (subsequently hydrolized into Pi + Pi), with a consequent ΔG = −45.6 kJ/mol. Without considering the cost for NAA generation, the use of free acetate deriving from NAA hydrolysis (or from any other source) would cause a ΔG imbalance of 14.1 kJ/mol acetyl-CoA (difference in the ΔG of the reaction ATP → AMP + Pi-Pi and acetate + CoA-SH → acetyl-CoA). According to the literature, NAA turnover is of 1.44 times/day (1,37); thus, considering an approximate NAA concentration of 9 µmol/g wet weight, it is easy to calculate that the amount of acetate originating from NAA hydrolysis is approximately 13 µmol/g wet weight/day. Hence, this could be the maximal acetyl-CoA production from NAA hydrolysis for the metabolic necessity of oligodendrocytes. Since the estimated brain glucose consumption is of 1,440 to 2,300 µmol/g wet weight/day (38), considering that oligodendrocyte glucose consumption is of about 2/5 of the total (almost equal to that of neurons) (38), it can be calculated in 288 to 460 µmol/g wet weight/day the glucose amount consumed by this cell line. Even if only the 60% of the pyruvate produced by glucose consumption through glycolysis were transported into mitochondria and oxidatively decarboxylated by pyruvate dehydrogenase to form acetyl-CoA, it can be estimated in 173 to 276 × 2 = 346 to 552 µmol/g wet weight/day the amount of acetyl-CoA that these cells can generate from glucose oxidation. Since the maximal amount of acetyl-CoA that might derive from NAA hydrolysis is 2.4–3.8% of the quantity produced from the 60% of oligodendrocyte glucose consumption it is, again, difficult to admit that the sole biological role of NAA is that of supporting acetyl-CoA for the biosynthetic oligodendrocyte metabolism (8). It should again be recalled that acetyl-CoA produced by glucose consumption is energetically much more convenient than that produced by free acetate. Last but not least, it is worth taking into account the relative rates of lipid myelin biosynthesis and rate of NAA hydrolysis. In the case of myelin, a need of about 10 nmol/g wet weight/day of cerebroside during remyelination is reported (39), with 12 pairs of carbon atoms needed for a de novo synthesis of a 24 carbon fatty acid (one of the most common fatty acid found in cerebrosides). If the 12 pairs of carbon atoms were obtained exclusively by acetate originating from NAA degradation, a total of 1.2 µmol/g wet weight/day of NAA must be hydrolyzed to satisfy this metabolic requirement (it is highly probable that under physiologic conditions the rate of myelin synthesis is much slower). As mentioned earlier, the amount of NAA hydrolyzed is of about 13 µmol/g wet weight/day (1,37). If the main and sole biological role of NAA were that of supplying free acetate from its hydrolysis to be used for myelin synthesis, then an amount of exceeding 11.8 µmol/g wet weight/day of acetate would be produced from NAA hydrolysis. Such an extraordinary waste of energy by neurons, producing NAA 12 times over its requirement for myelin synthesis, seems absolutely implausible. It is certainly conceivable that NAA has multiple functions in brain metabolism, including that of a molecular water pump (1), linked to the metabolism of the neurotransmitter N-acetylaspartylglutamate (40), a reservoir of glutamate (9) and an acetate donor for oligodendrocytes (8). But it is also highly possible that the intact molecule has further unknown biological functions to justify the energy expenditure for its continuous turnover. These present results might also help to explain why a second concussion occurring during the recovery phase of NAA homeostasis has the effect of remarkably protracting the time for NAA normalization (18,19). In fact, if the second concussion takes place when mitochondrial functions (mainly, their capacity to phosphorylate ADP into ATP) are not fully restored and, when Nat8l and Aspa protein levels are, respectively, lower and higher than normal, it is easy to see how the second insult may cause further depletion of NAA and further delay in its normalization (18,19). Additional studies on the mechanisms of NAA homeostasis, aimed at evaluating the effects of repeat concussions falling inside or outside the window of vulnerability, are certainly required. Results of the present study allowed characterization of the effects of graded TBI on the mechanisms regulating NAA homeostasis. Timing of the various molecular events influencing NAA concentrations in the postinjured brain might be of value either in determining the therapeutic windows for the administration of drugs aimed at modulating the processes involved in the recovery of NAA homeostasis or in new drug development for TBI. Improving our knowledge of the biological functions of NAA is likely to improve our understanding of the molecular events triggered by TBI, possibly opening new therapeutic windows for the TBI. It is hard to imagine that NAA, being such an abundant and energetically expensive compound, has little biochemical relevance; therefore, efforts should be made to fully elucidate the role of this still enigmatic molecule. This work was done at The Institute of Biochemistry and Clinical Biochemistry, Catholic University of Rome, Rome, Italy and The Neuropharmacology and Neurobiology Section, School of Clinical and Experimental Medicine, College of Medical and Dental Sciences, University of Birmingham, Birmingham, United Kingdom. This work was supported in part by research funds of the University of Catania, University of Rome Tor Vergata and Catholic University of Rome.